You know how there are some blogs you follow because your friends follow them, or Elle Decor says you should follow them, or they once wrote something you liked and haven't really cared since then but you hate to unfollow them... and then there are those blogs who are always fun and you have been known not to read them for a while so that in the event of a really crappy day you will have a post to lift your spirits? My favorite blog for hording and savoring is Rowley's Whiskey Forge. The Rowley is one Matthew Rowley who is always erudite, funny and authoritative and, when you remind him of this, he is always humble. Matthew quite literally wrote the book on moonshine entitled, Moonshine!. He may be one of the only people this side of the Schlesinger Library with more cookbooks than I. In recent days he has discussed mid century glass making, George Orwell's essay on picking hops, and he previewed his talk for the 13th annual Tiki Oasis celebration; a talk entitled, Squirrel Whiskey, Monkey Rum, and Sweet Spirit of Cats a'Fighting: The Taming of American Moonshine. His last post was on cobblers, of the liquid variety; specifically, a Blood Orange Cobbler with Lillet. The drink is a winner. First there is blood orange liqueur. Then there is Lillet. Finally there is marmalade. As a big preserve maker, I look for every chance to add a bit of jam to my drinks. That being said, for the Fourth of July, I needed a big jug of something to quench the crowd while I cooked (and washed dishes, and set up the fireworks!) I was margaritaed out! While I was preparing for the arrival of guests, I ran across a large bottle of Italian Blood Orange soda that had been moved to the back of the larder, so I set it out. One of my guests had traveled with an orange that landed on the counter. Last summer at the beach, I had picked up a bottle of Dogfish Head's blood orange vodka. Of course there was a big bottle of blood orange bitters, so the drink made itself. 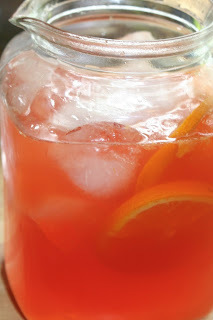 I was looking for a zippy name, but I just told the crowd it was a blood orange punch -- hey it packed a punch! Mix and pour over a big block of ice and sliced oranges. It is insufferably hot here so we have made the air-conditioner the official summer burn pit. Grab a drink and settle in. In the meantime, check out Rowley's Whiskey Forge. Matthew Rowley is definitely someone you want around your burn pit.